How ill the patient with pneumonia is depends largely on how much of the lungs is affected. In some case of pneumonia, the infection is so slight that there may be no symptoms at all. In fact, if chest X-ray were done on every child with a cough or cold, a surprising high number would show a minor degree of pneumonia. School age children may suffer typical lobar pneumonia. A day or two of a cold leads on to increase cough - initially dry but later producing phlegm which is frequently green or blood-stained. The during the day so that a temperature chart can look like an outline of a mountain range. At its height the child may shake all over (rigor). The child's face become flushed, and his breathing rapid and shallow. With each breath there is pain over the side of the affected lungs, making him groan or cry out. Abdominal pain may be present rather than chest pain so that occasionally lobar pneumonia is initially mistaken for appendicitis. The neck may be stiff causing confusion with meningitis. 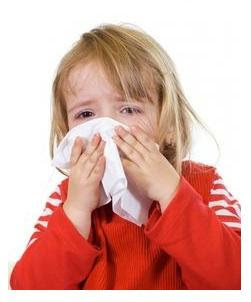 Without treatment, the illness continues for several days antibiotics bring about recovery, although the child cough up phlegm for several days after feels better. Younger children and babies rarely have such a clear-cut illness, suffering instead from bronchopneumonia. The infant may appear to have a cough or a cold, or may just have a high temperature and fever, or have rapid, shallow breathing. In some cases there may be combination of all these symptoms, pneumonia can sometimes be difficult to diagnose without a chest X-ray. Virtually all children with pneumonia recover completely. Complication are rare, but when they do occur they can be very serious: the bags (pleura); which surround the lungs may begin to fill the space between the lungs and pleura (empyema); and infection in certain bacterial pneumonia may spread into the blood stream (septicaemia). There is a sight danger with pneumonia that sputum or phlegm may block an air tube causing part of the lung to collapse since no air can reach it. In small babies, pneumonia may be very difficult to diagnose and signs of the disease are sometimes found in babies who unexpectedly (cot-death) with no previous evidence of any lung problem having been visible.